Gongura or Sorrel leaves (புளிச்ச கீரை (அ) புளி கீரை) has a specific sour taste and is commonly used in Andra cuisine. In Tamil Nadu, gongura is prepared as a side dish for ragi kali (கேப்பை களி), especially in the villages. Gongura is rich in iron, vitamins, minerals and anti-oxidants. 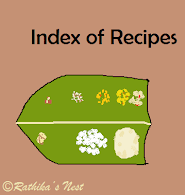 It can be used to make chutney, dhal, pachadi or pickle. I learnt this recipe from my relative, Mrs. Radha. This sambar has the unique sour taste of gongura and goes well with rice and poriyal. Method: Wash toor dhal well, add 400 ml of water, and pressure cook for 6-7 minutes (6-7 whistles). Separate gongura leaves from the stem, wash 2-3 times in water and keep aside. Heat oil in a kadai, add mustard seeds, when they start to sputter add split urad dhal and methi seeds. Fry till the dhal turns golder brown. Add the onion and fry till it becomes transparent. Now add tomato pieces and required salt. Cover and cook on a low flame till tomatoes become pulpy. Add in gongura leaves and 50 ml of water. Cover and cook till gongura leaves become soft. Add sambar powder, dhania powder, salt and jaggery to one tumbler (200ml) of water and mix well. Add this mixture to the kadai and bring it to boil. Allow the mixture to boil for 2-3 minutes. Mash the dhal using an ordinary hand blender or a ladle till it is soft and uniform in consistency. Add the dhal to the boiling kuzhambu and mix well. Bring it to boil and then simmer for 2 minutes. Switch off the fire. Serve hot with rice, poriyal or appalam.